One of the hardest things about Raspberry Pi and Arduino is figuring out where to stick all the pieces. While both of these systems work well alone — you can have a lot of fun with just a board and an internet connection — it’s also fun to add little things like printers and screens to make fun projects. That’s where the Atomo comes in. This modular kit comes from Jonathan Buford, a Hong Kong-based maker, and it’s certified by Arrow Electronics, a major manufacturer. 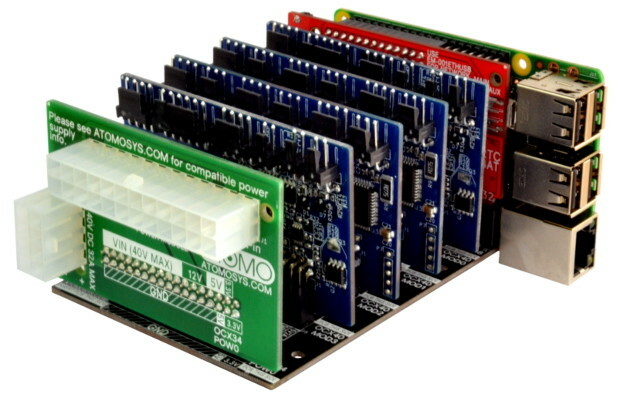 “Atomo is a replacement for Arduino and an accessory for Raspberry Pi,” said Buford. He hopes to make it easier to build more complex projects with Raspberry Pis without requiring extensive electronics know-how. There are a number modules, including I/O boards, network expansion boards and even power supplies for bigger projects. For example, the project below has four I/O adapters and a power supply all connected to a Raspberry Pi. This means you can do some really interesting things with robotics and even hydroponics with the package the size of a hunk of cheese. The kit costs $39 for early birds and should ship in June. You’ll be able to buy more packages and mix and match them as necessary. “We’ve made all of our controllers compatible with the HAT connector on the Raspberry Pi. This lets you program on the Pi and update the controller. Or just use the Atomo as a modular HAT. This is perfect for ROS robots or any system where you have the Pi for processing or interface but need more power, IO, or real time control,” wrote Buford. I, for one, welcome our Raspberry Pi and Arduino compatible robot overlords.